Personalised bath towel in fashionable bluebell blue colour. 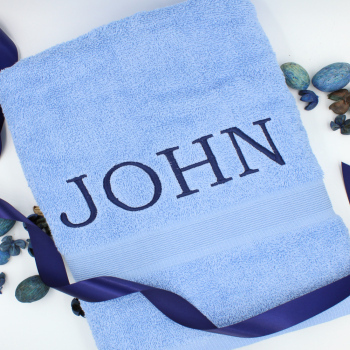 Personalised bath towel in fashionable bluebell blue colour. Makes a special gift for all ages that is very useful too. 500gsm cotton bath size 75x125cm towel. Personalised embroidery - your choice of text a name, nickname or initials embroidered in a thread colour and font style of your choice. Amys Gifts embroidery gift items are made to order and we do our best to try and dispatched within 2 days.